The 400 series from Levi has a nice variety of relaxed fit jeans. 414 Relaxed Straight Jeans: Levi's upped the ante on your favorite relaxed fits  so you can look great in your most comfortable jeans. With an easy fit though the hip and thigh, these jeans feature a classic straight leg. With an authentic look and feel, the low stretch denim has just the right amount of give, and will keep its shape over time. 415 Relaxed Boot Cut Jeans: With an easy fit through the hip and thigh, these jeans feature a classic boot cut leg for a flattering, leg-lengthening look. Constructed with stretch denim, engineered for comfort. 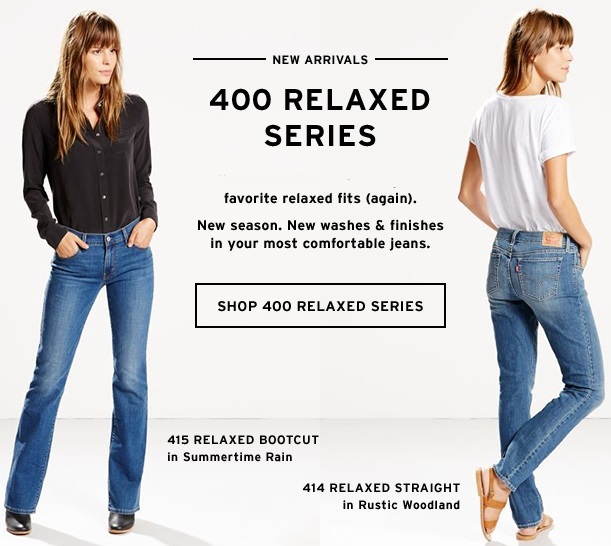 Shop the Levi's 400 Series Relaxed Jeans and other series of jeans at their website. Learn more about Levis Strauss & Co. here on Apparel Search. No matter how you say it, every piece of Levi’s® clothing embodies a sense of craft and quality. This includes the 400 series jeans as well as the classic fit of Levi’s® 501® jeans to the refined details of Levi’s® Made & Crafted collection. Because the Levi Strauss & Co. is committed to doing good for people and the earth, they support sustainably grown cotton and the Better Cotton Initiative to improve the cotton production process.